The more than $800,000 expected to be raised by the Archdiocese of Baltimore’s annual gala for education will support 160 scholarships and contribute to an endowment fund for future educational needs. Tyler Tate, gala chairman and president of Lewis Contractors, thanked the more than 800 people gathered for the eighth annual event Sept. 24 at the Baltimore Marriott Waterfront for helping families that might not otherwise be able to send their children to Catholic schools. Tate was among the speakers at the gala who pointed out the success of the archdiocese’s Catholic schools: 99 percent graduation rate from high school, with 98 percent heading on to college; and SAT scores 150 points above the Maryland average, among other statistics. He noted that while it is important to raise “smart kids who think critically,” it is more important to help parents raise good kids. 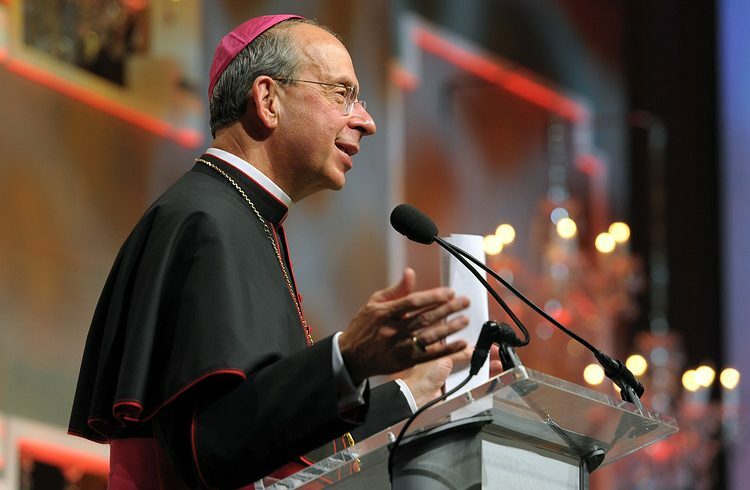 The gala especially supports the archdiocese’s Partners in Excellence program, started 20 years ago by Cardinal William H. Keeler, archbishop of Baltimore, and Raymond “Chip” Mason. Over the years, PIE has provided more than $28 million in partial, need-based scholarships for elementary and high school students in Baltimore City. One of the students assisted by PIE regaled the crowd with his tales of studying at a Catholic school in Baltimore. Jeremy Freeman, who now teaches first grade in Baltimore via the Teach for America program, thanked his mother, Geneva Freeman, for making the sacrifice to send him to Father Charles Hall School. Freeman graduated from Cornell University in 2105 with a bachelor’s degree in applied economics and management. He accepted a position with Teach for America, which provides teachers for low-income schools. Each corps member, as the teachers are called, makes a two-year commitment. Freeman is teaching at William Pinderhughes Elementary/Middle School in West Baltimore. Another Catholic school alumnus addressed the gala crowd. Kelly Wright, a weekend anchor for Fox News Channel and nationally known recording artist, mixed his message with song, paraphrasing Marvin Gaye’s “Mercy Mercy Me” with lyrics about students and Partners in Excellence. His mother eventually sent Wright to live with his grandmother in Hagerstown where he could attend St. Maria Goretti. He said he still has great friendships from his time at the school. “It goes to the heart of people partnering for excellence and June (his mother) not willing to accept that her son would become a statistic in the worst way. Instead she planted seeds of excellence in me; the school reinforced it,” he said. He learned at home a sense of purpose and value that God had created him for something good. Closing the banquet, Archbishop William E. Lori of Baltimore thanked the attendees for helping young people use their God-given talents to become the people God has called them to be. He acknowledged the success of the students in Catholic schools and noted that the support of Catholic students is essential. “My faith, our faith, compels us to do this,” so that the dignity and worth of each child is affirmed and they can see the beauty of God’s creation through the eyes of faith. The entertainment included the pep band from The John Carroll School in Bel Air, the choir from Archbishop Spalding High School in Severn and a dance troupe from Mercy High School in Baltimore. This post was adapted from The Catholic Review. See the original article here. Norton.com/setup – Visit the link in order to Get Started with Your Norton Setup. You may easily Setup Norton with the help of this link or call us for Norton.com/setup or http://www.Norton.com/Setup. The Partners In Excellence Scholarship program gives young people hope and opportunity by providing partial, need-based scholarships for elementary and high school. Co-sponsored by the Archdiocese and over 400 philanthropies, businesses and private benefactors, Partners In Excellence has provided over $32.5 million in tuition assistance to thousands of families in Baltimore City.